I already wrote about seeing the volcano near Bandung when Josh and I went on our Tropical Christmas trip, but since we had a car at our disposal for the day, we wanted to check out some of the other attractions in the area. When our driver recommended the floating market, we were intrigued and agreed that it would make a great addition to our itinerary, though we weren’t entirely sure what it was. As it was a holiday, the market was very full, and Josh and I were met with chaos when we entered. Our driver pointed us to a building where we could redeem our entrance ticket for a hot drink–which was not particularly necessary on such a hot day, but once in the crowded building, we didn’t have much choice but to shuffle through the line to the drinks, where we were given free cups of Milo. Once outside again, we found a shaded area under a tree and sat on some big rocks next to the water while we sipped our watery hot chocolate and admired the mountains that rose up in the distance. 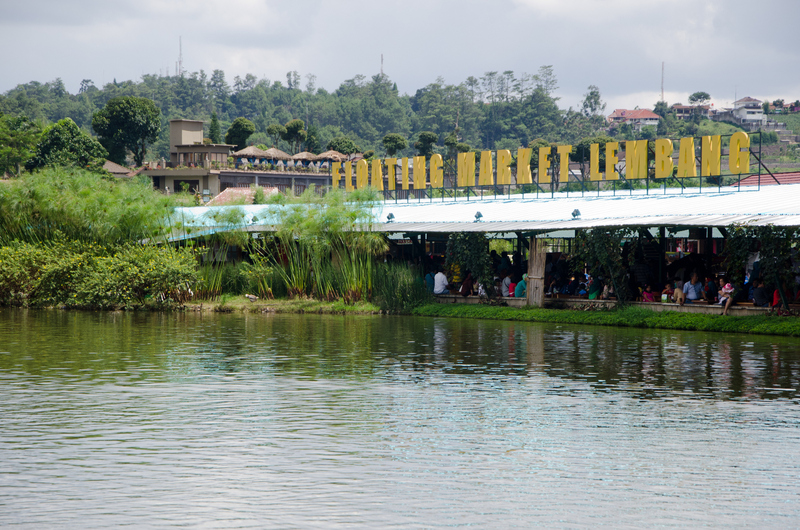 As it turned out, Lembang Floating Market isn’t a market in the conventional sense; rather than being a place for people to buy produce and other goods, it was a tourist site–and a very well-maintained one at that. There was a grassy park area that included a small lake where people could rent boats. One section had some small rides and games for children. And at the back of the park, there were many boats at the side of the lake, each boat selling a different kind of food. While much of the food looked delicious, we weren’t hungry for anything and we didn’t feel like exchanging money for the tokens that you use to purchase your meals. We walked around and people-watched for a little bit before heading back toward the entrance. 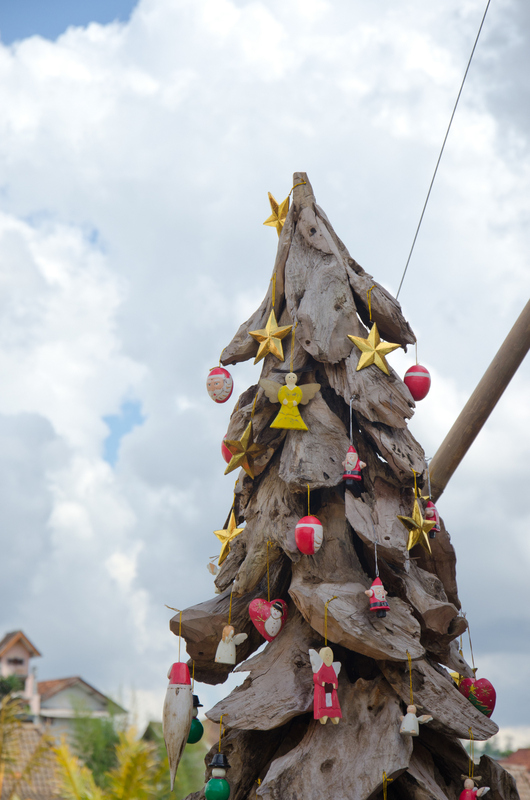 Overall, I felt like Lembang Floating Market was a nice place to spend a little time since we were in the area, but I wouldn’t recommend going to Lembang just for the market. Rather, you can visit the volcano in the morning and head to the market afterward for some lunch. On the other hand, it looked like a great place for children to play, so families with little ones would probably find it a worthwhile trip to make a detour to Lembang for the market alone. 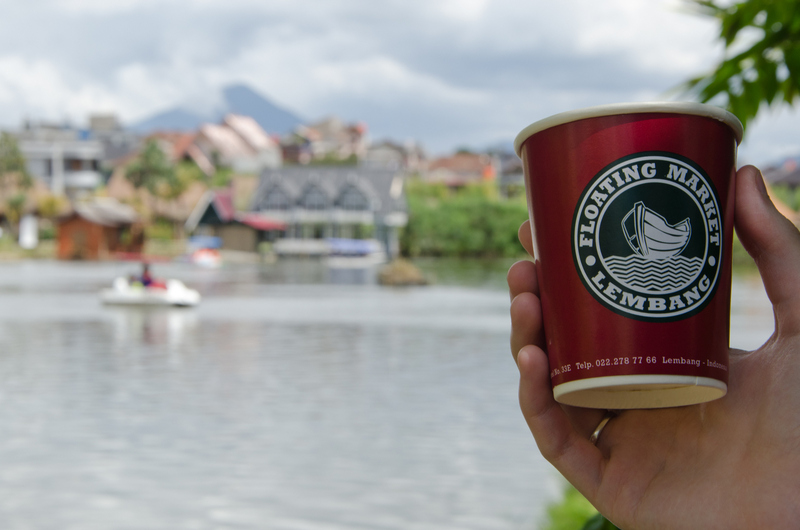 My last piece of advice is to avoid visiting the Lembang Floating Market during holidays. Sure, the Christmas decorations added a nice touch, but the crowds were insane. I think this place would be much nicer on a quieter day! 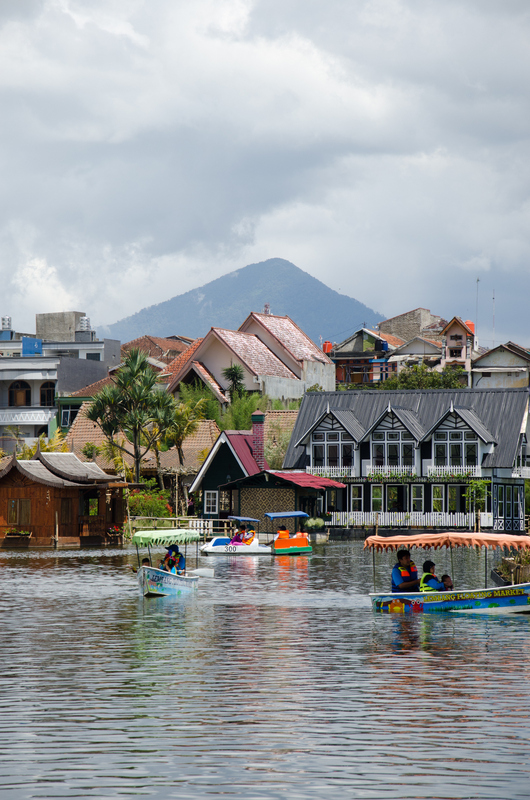 If you would like to visit Lembang Floating Market, your hotel can tell you specifically how to get there by public transport. I personally recommend renting a car for the day, which saves a lot of time and effort and will allow you to see much more of the area at your own (air-conditioned) pace. I hired our car from Mulia Car Rental for 650,000 IDR (about 54 USD), which included the car, gas, parking, tolls, and a local driver. Lembang Floating Market is in the town of Lembang, which is slightly more than a 30-minute drive away from Bandung (though probably closer to an hour if you hit heavy traffic). Admission is 10,000 Rp/person (~$0.85 USD), and your entrance ticket can be redeemed for a free hot drink. 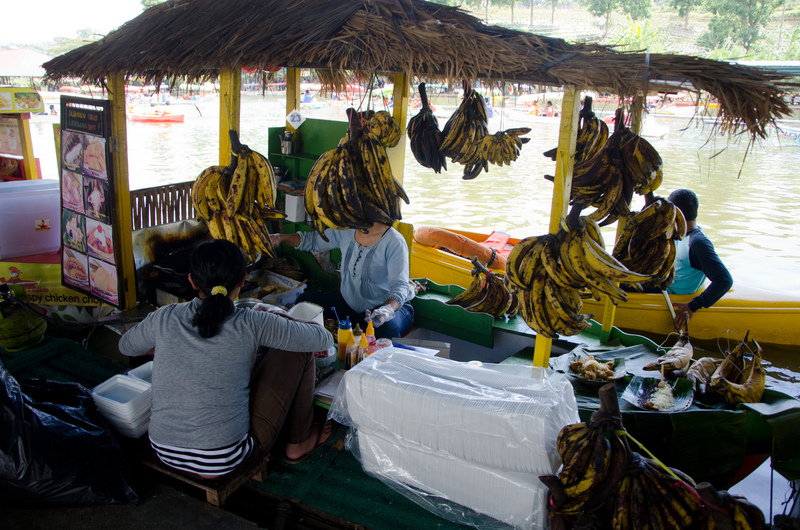 Food can be purchased from the boat vendors, but you must first exchange money for tokens in order to buy the food.